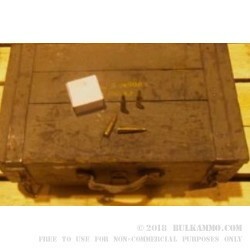 Generally this is 1970’s and 1980’s ammunition from the Eastern Blok that is mostly centered out of the Yugoslavian plants and is built to the military specification for use in SKS’s, AK’s and other platforms that take the 7.62x39 round. 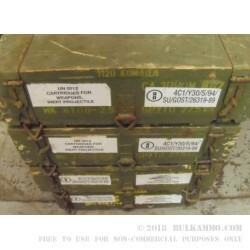 This is premium ammunition from the mil-spec side of things and is hard to match from the pricing perspective. 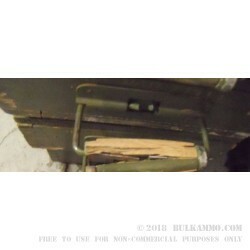 The generous case lot sizes for the money offer a lot of shooting for very little out of pocket. An important note: this ammunition uses component parts (usually just the primer) that is corrosive, and as such, care must be taken to clean your firearm well after each range trip if it is to be stored. It is also possible that batches will contain corrosive powders also. To clean the firearms after each trip shooting, will be a mandatory bit of preventative maintenance for the tradeoff of the low price and the manufacturing origin. This does not affect accuracy if you maintain your firearms, and a simple cleaning with the proper solvent will remove any traces of fouling and corrosive residue that could otherwise harm the gun. Almost 100% of contracted ammunition in the mil-spec space for this caliber is exactly the same with regards to corrosive components. This is not a one off cartridge that happens to be corrosive. That said, this is among the most reliable manufactured 7.62x39 and offers an amazing price point for serious shooters. 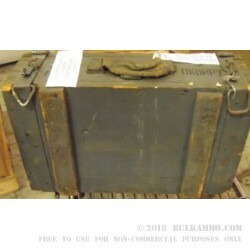 i bought one of theses crates at a local gun show, factory sealed, and produced in 1986. I got it roughly for the same price. First impression was pretty good, nice clean brass casings. I used about 180 rounds through my AK and it did pretty good, except i had 2 rounds malfunction, the primer had failed on both of the bullets, but 2 out of 180 isn't bad. 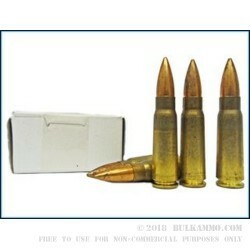 only real downside to this ammo is the fact that it is corrosive and will gunk up your gun.